Ni x Co1-xMoO4 (0 ≤ x ≤ 1) nanowire electrodes for lithium-ion rechargeable batteries have been synthesized via a hydrothermal method, followed by thermal post-annealing at 500°C for 2 h. The chemical composition of the nanowires was varied, and their morphological features and crystalline structures were characterized using field-emission scanning electron microscopy and X-ray powder diffraction. The reversible capacity of NiMoO4 and Ni0.75Co0.25MoO4 nanowire electrodes was larger (≈520 mA h/g after 20 cycles at a rate of 196 mA/g) than that of the other nanowires. This enhanced electrochemical performance of Ni x Co1-xMoO4 nanowires with high Ni content was ascribed to their larger surface area and efficient electron transport path facilitated by their one-dimensional nanostructure. Among the types of anode materials available for rechargeable lithium-ion batteries, graphite has been commercialized. 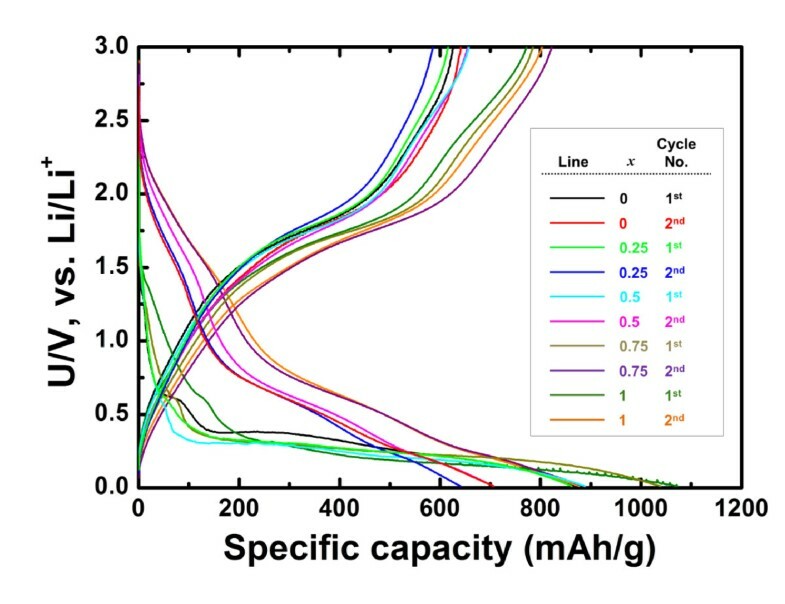 However, because of its drawbacks, such as capacity limitations (theoretical capacity of 372 mA h/g), initial loss of capacity, and structural deformation [1, 2], one of the current areas of interest in lithium-ion battery research is the search for new anode candidates that have large reversible capacities. In the past decade, transition metal oxides (M x O y , M = Co, Ni, Cu, Fe) that can deliver a high reversible capacity by conversion reaction mechanisms (M x O y + ne- + n Li+ ↔ x M0 + Li n O y ) have been considered as an alternative to commercial graphite anodes for lithium-ion batteries [3–10]. Metal molybdates, AMoO4-type compounds (where A is a divalent metal ion), have attracted the interest of researchers because of their electronic and magnetic properties and their many applications, such as catalysis and photoluminescence [11–14]. Recently, CoMoO4 and NiMoO4, synthesized with nanowire morphology by a simple hydrothermal method, were exploited as materials for lithium-ion batteries but were only applied as cathodes [15, 16]. In this paper, we report the fabrication of Ni x Co1-xMoO4 (0 ≤ x ≤ 1) nanowire electrodes by a hydrothermal method, followed by thermal post-annealing. We also demonstrate the superior electrochemical performance of Ni x Co1-xMoO4 nanowires for lithium-ion battery anodes. Ni x Co1-xMoO4 (0 ≤ x ≤ 1) nanowires were synthesized by a simple hydrothermal method, in which high purity Ni(NO3)2·6H2O (99.999%; Sigma-Aldrich, Saint Louis, MO, USA), Co(NO3)2·6H2O (98%; Sigma-Aldrich, Saint Louis, MO, USA), and Na2MoO4·2H2O (99.5%; Sigma-Aldrich, Saint Louis, MO, USA) were used as source materials, followed by post-annealing at an elevated temperature. Initially, to prepare a clean solution (total cationic concentration of 0.1 M) with a molar fraction (x) of Ni (x = 0, 0.25, 0.5, 0.75, and 1), controlled amounts of Co- and Ni-containing reagents were dissolved in deionized water (80 mL) under constant magnetic stirring; then, the solution was added to an aqueous solution (80 mL) containing 0.1 M of Na2MoO4·2H2O. This resulting solution was transferred into a Teflon-lined stainless steel autoclave, sealed, and maintained at 180°C for 8 h. After the reaction was completed, the resulting solid products were harvested by centrifugation, washed with deionized water and acetone several times, and then dried at 60°C for 6 h in a vacuum oven. Finally, the as-prepared hydrate nanowire precursors were post-annealed at 500°C for 2 h to dehydrate them. The morphologies and crystal structures of the prepared Ni x Co1-xMoO4·n H2O and Ni x Co1-xMoO4 (0 ≤ x ≤ 1) nanowires were investigated using field-emission scanning electron microscopy [FE-SEM] (10 kV; FEI NOVA, Tokyo, Japan) and X-ray powder diffraction [XRD] (λCuKa = 1.5405 Å; Miniflex II, Rigaku, Tokyo, Japan). The thermal behavior of the as-prepared hydrate samples was analyzed by thermogravimetric analysis [TGA] (DTG-60H, Shimadzu, Kyoto, Japan). For TGA, the samples were heated from room temperature up to 800°C at a heating rate of 10°C/min in air. For the electrochemical evaluation of the Ni x Co1-xMoO4 (0 ≤ x ≤ 1) nanowires, positive electrode films were cast on a Cu foil by mixing each nanowire powder (1 to 2 mg) with Super P carbon black (MMM Carbon, Brussels, Belgium) and Kynar 2801 binder (PVdF-HFP, Arkema Inc., King of Prussia, PA, USA) in a mass ratio of 70:15:15. The assembled Swagelok-type cells composed of a positive electrode, negative electrode (lithium metal-foil), and separator film (Celgard 2400, Celgard LLC, Charlotte, NC, USA) saturated with a liquid electrolyte consisting of LiPF6 (1 M) dissolved in a solution of ethylene carbonate and dimethyl carbonate (1:1 v/v) were cycled at voltages between 0.01 and 3.0 V using an automatic battery cycler (WBCS 3000, WonaTech, Seoul, South Korea). Figures 1a to 1e show typical FE-SEM images of as-prepared Ni x Co1-xMoO4·n H2O precursors with various cationic compositions. All of the samples were of nanowire morphology regardless of their compositional differences. However, the diameters and lengths of the nanowires tended to decrease with increasing Ni concentration. As shown in Figure 1e, the NiMoO4·n H2O nanowires were agglomerated acutely and even formed clusters that were several microns in size. The agglomeration of the nanowires might be due to strong attractive forces between the small-sized nanowire particles. 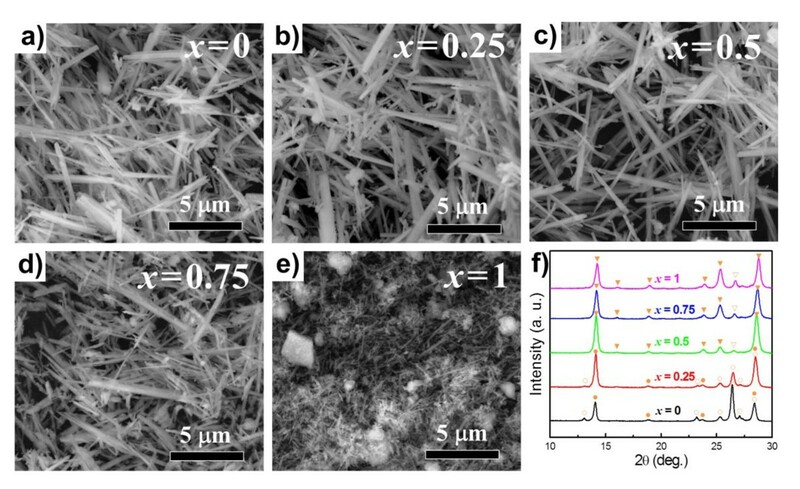 The crystalline structures of the as-prepared Ni x Co1-xMoO4·n H2O nanowires were confirmed from their XRD patterns, as seen in Figure 1f. The XRD patterns taken from all Ni x Co1-xMoO4·n H2O nanowires agreed well with previously reported patterns for CoMoO4·n H2O (JCPDS no. : 26-0477). Morphologies and crystal structures of Ni x Co 1-x MoO 4 · n H 2 O nanowires. (a-e) Typical FE-SEM images of as-prepared Ni x Co1-xMoO4·n H2O nanowire precursors with various x values and (f) their corresponding X-ray diffraction patterns (by KS Park et al.). The dehydration process was investigated using the thermogravimetric [TG] technique; the results of which are shown in Figure 2. 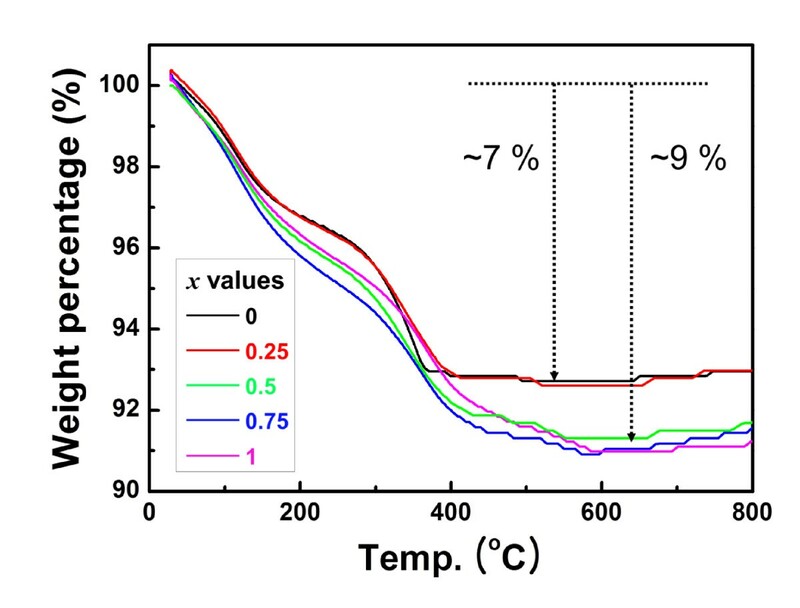 The typical TG curves obtained from the Ni x Co1-xMoO4·n H2O nanowires in the temperature range from 30°C to 800°C showed net weight losses of 7% to 9% for each sample. This weight loss was mainly attributed to the evolution of species related to water molecules, such as reversibly bound water molecules (low temperature), water molecules forming an integral part of the crystal structure of Ni x Co1-xMoO4·n H2O (medium temperature), and water molecules reversibly bound to the hydrate crystal phase (high temperature) [14, 15]. On the basis of the TG results, the post-annealing temperature for all the hydrate samples was 500°C, at which almost all water molecules were removed sufficiently to form Ni x Co1-xMoO4 nanowires. Thermal behavior of Ni x Co 1-x MoO 4 · n H 2 O nanowires. TG curves for as-prepared Ni x Co1-xMoO4·n H2O nanowire precursors with various values of x, heating at a rate of 10°C/min in air (by KS Park et al.). Figures 3a to 3e show FE-SEM images of Ni x Co1-xMoO4 (0 ≤ x ≤ 1) nanowires obtained by post-annealing the Ni x Co1-xMoO4·n H2O nanowire precursors at 500°C for 2 h. All post-annealed samples maintained their pristine nanowire morphologies. Although a marked change in the diameter or length of the nanowires after post-annealing was not observed, they seemed to be agglomerated slightly and were forming bundles, which could lead to a decrease in their surface area. In order to confirm the change in surface area that may have occurred during post-annealing of Ni x Co1-xMoO4·n H2O nanowire precursors, the Brunauer-Emmett-Teller [BET] (Belsorp-mini, BEL Japan Inc., Osaka, Japan) technique was carried out at liquid nitrogen temperature. From the results presented in Table 1 it can be confirmed that the surface areas of Ni x Co1-xMoO4 nanowires in all compositions were slightly decreased compared with those of the corresponding Ni x Co1-xMoO4·n H2O nanowires. This was ascribed to the aggregation and growth of the nanowires. Furthermore, it was found that the surface areas of the nanowires gradually increased with increasing Ni concentration because of the corresponding decrease in their diameter and length. Morphologies and crystal structures of Ni x Co 1-x MoO 4 nanowires. (a-e) FE-SEM images of Ni x Co1-xMoO4 nanowires with various x values and (f) their corresponding X-ray diffraction patterns. Filled circle, empty circle, filled inverted triangle, and empty inverted triangle correspond to α-CoMoO4, β-CoMoO4, α-NiMoO4, and β-NiMoO4, respectively (by KS Park et al.). Comparison of surface areas for as-prepared Ni x Co1-xMoO4·n H2O and Ni x Co1-xMoO4 nanowires dehydrated at 500°C for 2 h (by KS Park et al.). To investigate the crystal structures of the Ni x Co1-xMoO4 nanowires, their XRD patterns were examined carefully. The XRD patterns obtained for the CoMoO4 and NiMoO4 nanowires in Figure 3f corresponded well with their bulk materials (JCPDS nos. : 25-1434, 21-0868, 33-0948, and 45-0142 for α-CoMoO4, β-CoMoO4, α-NiMoO4, and β-NiMoO4, respectively). However, as can be seen in Figure 3f, both end-members had α- and β-phases corresponding to each material together. It is known that single-phase β-CoMoO4 and α-NiMoO4 can be formed by fast cooling and by slow cooling, respectively, to room temperature after post-annealing of their hydrates [14, 17, 18]. Meanwhile, D. Vie et al. reported that the α-CoMoO4 phase became detectable as a minority phase after heat treatment of the amorphous solid precursor at a temperature above 700°C . On the basis of these reports, we believe that the coexistence of α- and β-phases in CoMoO4 and NiMoO4 nanowires can be attributed to the medium cooling rate (≈10°C/min to 30°C/min) applied after post-annealing or to a change of phase transition temperature with the unique morphologies of the samples. 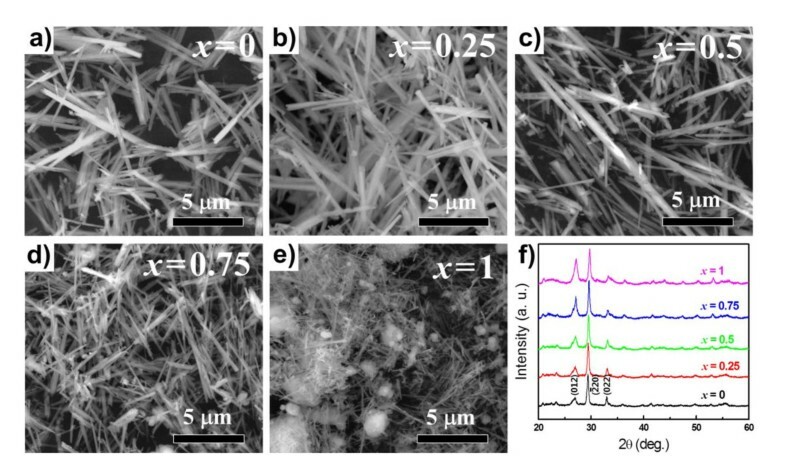 Among the Ni x Co1-xMoO4 nanowires with a medium composition, the XRD pattern of the Ni0.25Co0.75MoO4 nanowires agreed well with that of CoMoO4. However, in contrast with that observed for pure CoMoO4, the peaks corresponding to α-CoMoO4 became more dominant compared with those of β-CoMoO4, indicating that relative intensities of the diffraction peaks of the α-phase increase with Ni content . In the case of the Ni0.5Co0.5MoO4 nanowires, it was found that the XRD pattern corresponded closer with pure NiMoO4 than with pure CoMoO4 (Figure 3f). This implies that the basic crystal structure of the nanowires was transformed from CoMoO4-related structures into NiMoO4-related structures. The XRD pattern of the Ni0.75Co0.25MoO4 nanowires also agreed with that of pure NiMoO4. It should be noted that no secondary phases, such as NiO and CoO, were detected in any of the XRD patterns, which indicated that CoMoO4 and NiMoO4 formed solid solutions perfectly. To evaluate the electrochemical performance of the Ni x Co1-xMoO4 nanowire electrodes, typical voltage-specific capacity curves were recorded at a current rate of C/5 (≈196 mA/g; note that 1 C ≈ 980 mA/g on the basis of the reaction in Equation 2) in a potential window between 0.01 and 3.0 V (Figure 4). In the first discharge reaction, samples containing nickel reacted with lithium at a lower potential region (≈0.4 V to 0.01 V) compared with the CoMoO4 nanowire electrode (≈0.3 V to 0.01 V). 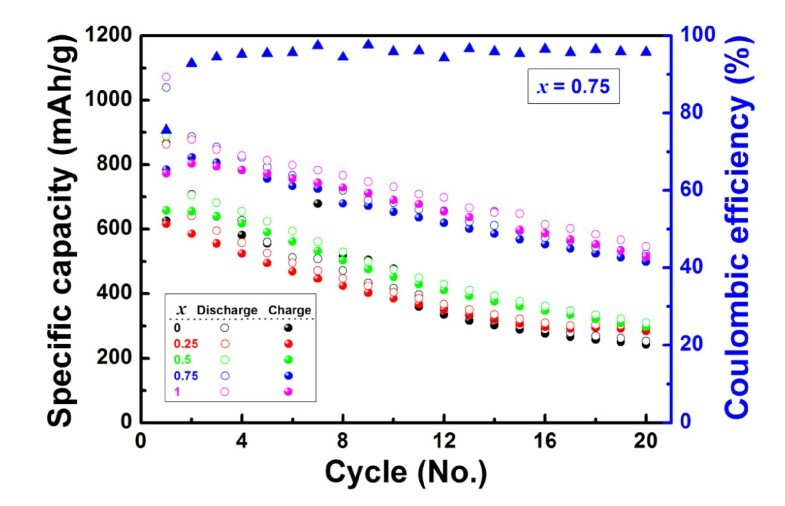 Notably, the first discharge capacities for Ni0.75Co0.25MoO4 and NiMoO4 were higher than their theoretical capacities; this might be ascribed to the formation of the solid electrolyte interface-like organic layer. Subsequent second discharge-charge reactions occurred reversibly on the basis of the reaction in Equation 2. These highly reversible capacities of Ni x Co1-xMoO4 nanowire electrodes could be an evidence for delivering capacity by conversion mechanism. Charging-discharging curves of Ni x Co 1-x MoO 4 nanowire electrodes. Charging-discharging curves of the Ni x Co1-xMoO4 nanowire electrodes with various x values at a rate of C/5 (by KS Park et al.). Figure 5 shows the specific capacity of Ni x Co1-xMoO4 nanowire electrodes versus the cycle number at a current rate of C/5. When the values of x were 0, 0.25, and 0.5, the reversible capacities of Ni x Co1-xMoO4 nanowire electrodes faded rapidly even during the initial cycles, resulting in a poor reversible capacity of ≈290 mA h/g after 20 cycles. This result was attributed to the small surface areas of the nanowire electrodes. From the BET results summarized in Table 1 it was found that their surface areas were very small compared with those of the other nanowires, which led to a small electrode/electrolyte interface, resulting in a poor reversible capacity. Meanwhile, the reversible capacity of the Ni x Co1-xMoO4 nanowire electrodes with x values of 0.75 and 1 (≈520 mA h/g after 20 cycles) was larger than that of the previously mentioned three nanowire electrodes because of the increased electrode/electrolyte interface that resulted from the larger surface area of the nanowires (Table 1). In accordance with the BET results, the electrochemical performance of the NiMoO4 nanowire electrode was expected to be vastly superior compared with that of the Ni0.75Co0.25MoO4 nanowire electrode. However, the electrochemical performances of both electrodes were similar, as shown in Figure 5 due to the aggregation of the NiMoO4 nanowires. When we fabricated the positive electrode, the carbon black that is commonly used as a conducting additive was mechanically mixed with the nanowires as the active material. At that time, clusters formed by aggregation of the NiMoO4 nanowires could not be mixed efficiently with carbon black, which resulted in impairing their electrochemical performance by restriction of the electronic conduction paths from each nanowire to a current collector. In contrast, the Ni0.75Co0.25MoO4 nanowires did not form such clusters during the synthesis process. For this reason, the Ni0.75Co0.25MoO4 nanowire electrode could deliver a reversible capacity as high as the NiMoO4 nanowire electrode. Furthermore, the Ni0.75Co0.25MoO4 nanowire electrode exhibited a superior coulombic efficiency of ≈95% (Figure 5). Electrochemical properties of Ni x Co 1-x MoO 4 nanowire electrodes. 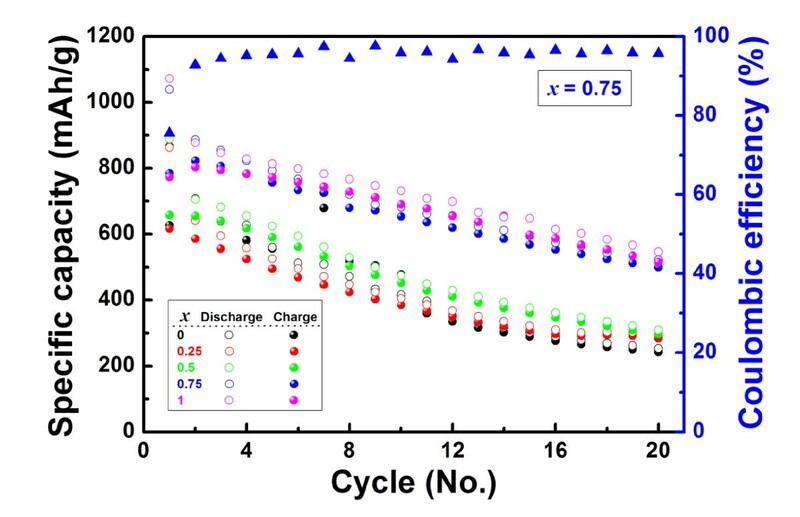 Variation of the discharge (open circles)-charge (solid circles) specific capacity and coulombic efficiency (solid triangle) versus the cycle number at a rate of C/5 for the Ni x Co1-xMoO4 nanowire electrodes with various x values (by KS Park et al.). In summary, we have successfully synthesized Ni x Co1-xMoO4 (0 ≤ x ≤ 1) nanowire electrodes by employing a hydrothermal method to prepare hydrate nanowires, followed by post-annealing of the as-prepared hydrate nanowires. Although α- and β-phases coexisted in all of the nanowire samples, no secondary phases were detected, indicating that CoMoO4 and NiMoO4 formed perfect solid solutions. Compared with the reversible capacity (≈290 mA h/g after 20 cycles) of the Ni x Co1-xMoO4 nanowire electrodes with x values of 0, 0.25, and 0.5, the reversible capacity of the nanowire electrodes containing a higher Ni content (x = 0.75 and 1) increased more (≈520 mA h/g after 20 cycles). Despite the difference in surface area between the NiMoO4 and Ni0.75Co0.25MoO4 nanowires, the reason for the observation of their similar reversible capacities was because of the agglomeration of NiMoO4 nanowires and the resulting restriction of the electronic conduction paths from each nanowire to a current collector. We anticipate that this approach will facilitate the tailoring of other electrodes based on solid solution materials, to provide electrodes with superior electrochemical performance. This work was supported by the National Research Foundation of Korea (NRF) grant funded by the Korea government (MEST; nos. 2010-0029617 and 2011-0005776). K-SP carried out the Ni x Co1-xMoO4 (0 ≤ x ≤ 1) nanowire sample preparation and drafted the manuscript. S-DS and H-WS participated in microstructural and electrochemical analyses. D-WK designed the study, led the discussion of the results, and participated in writing the manuscript. All authors read and approved the final manuscript.